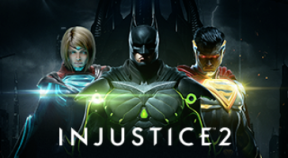 Power up and build the ultimate version of your favorite DC legends in INJUSTICE 2 – winner of IGN's best fighting game of 2017. •ALL DOWNLOADABLE CONTENT CHARACTERS: Includes 10 additional characters and 5 Premiere Skins – including Hellboy and TMNT. •EVERY BATTLE DEFINES YOU: With every match you'll earn gear to equip, customize and evolve your roster. •A NEW THREAT RISES: Picking up where Injustice left off, Batman struggles against Superman's regime, as a new threat appears that will put Earth's very existence at risk. •THE BEST OF DC: Choose from the biggest DC Universe roster ever and battle across iconic locations in epic scale battles. •BUILT BY NETHERREALM: Developers of the best-selling and critically acclaimed MORTAL KOMBAT franchise. Power up and build the ultimate version of your favourite DC legends in INJUSTICE 2. •EVERY BATTLE DEFINES YOU: With every match you'll earn gear to equip, customise and evolve your roster. •THE BEST OF DC: Choose from the biggest DC Universe roster ever and battle across iconic locations in epic-scale battles.